In the dying days of World War II inferior materials, because of war shortages, were used to repair a gas tank. It exploded, killing 135 and injuring one hundred others. 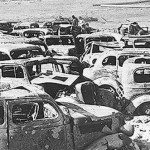 In the dying days of World War II when all the media were concentrated on the final outcomes in Germany and Japan, a massive gas explosion in Cleveland was almost totally overlooked. It was a devastating blast, killing 135 and injuring one hundred others. Liquefied natural gas was a fairly new thing at that time, Cleveland being only the second commercial installation in the nation. Liquid natural gas (LNG), which is mainly methane gas, is a popular fuel for homes because it is odorless, colorless, noncorrosive, and nontoxic. It is used as a gas but stored in liquid form for compactness. LNG was formed from the buried remains of tiny plants and sea animals that died more than two hundred million years ago. These energy-rich materials slowly decayed and then changed form until all that was left were concentrations of natural gas in layers of rock. Natural gas is removed from the earth by drilling wells into the rock, then using pipes to bring the gas to the surface. Liquid propane gas (LPG) is also, like LNG, composed of the remains of plants and animals that inhabited the earth millions of years ago. Propane is gaseous at normal temperatures and under moderate pressure it becomes a liquid that vaporizes into a clean-burning gas when released from its storage container. Propane is sometimes referred to as the kissing cousin of natural gas and petroleum because it is usually found mixed with natural gas and petroleum deposits. Cleveland’s commercial LNG installation in 1941 was the second in the country and it served the community well for the following three years despite the fact that little was known at that time about the dangers associated with its use. In 1944, a larger tank was added to meet the demands of Cleveland’s consumers but, because it was wartime, steel could not be obtained for the LNG container and an alloy was selected in its place. This alternative material was unsuitable for storage at very low temperatures and before long it began to leak, releasing super cold gas into the atmosphere. A fog began to form over the east side of Cleveland but authorities and residents were unaware of the extreme danger it posed. When mixed with air, LNG becomes a time bomb ready to explode on first contact with a spark. A spark did come and everyone on the east side of Cleveland knew what happened next. A massive explosion was triggered, America’s worst from LNG in all of the twentieth century. Emergency repair workers were called in but there was no spare tank into which they could transfer the gas. All were filled to capacity because winter was approaching. The only alternative was to repair the leak. No one knows what happened next since all the men and all the equipment vanished after the blast. There was a spark either in the course of the repair or elsewhere, and the conflagration followed. A home one block away from the gas tanks exploded into flames and the occupants managed to run away before they were incinerated. Others joined them and as they looked back they could see that flames were raising high into the air. A series of explosions followed the first one as tank after tank succumbed to the heat and exploded like powerful bombs. Every building for several blocks was flattened and beneath the ground the main gas pipes were ripped out. Manhole covers were flung into the air like toys and must have added to the damage before reaching the ground again. The firestorm from all the explosions destroyed more than 150 homes and left ten times that number without a place to stay, all the more tragic because they were the poorest residents of the city. Cleveland’s tragedy was little known at the time because of the war. Even the news of 135 dead and almost as many additional ones injured did not seem important. It was a time when large numbers of deaths were being reported from the war fronts. The biggest entry in one newspaper was a short statement on the loss of hundreds of cars in one parking lot. For about twenty years there were no additional commercial installations but extensive research was undertaken to ensure that a major explosion would not occur again. New regulations were introduced governing choice of materials for storage tanks, procedures for transportation of LNG, and locations of storage tanks at a distance from residential sites. Other rules prescribed ways of testing tanks and installing safety valves on main pipelines. Today there is widespread confidence in the safety of LNG plants and it is of interest that Cleveland has featured, once again, in pioneer usage of this fuel. In 1995, the Greater Cleveland Regional Transit Authority was the first to adopt natural gas as its alternative fuel of choice for buses. It had the biggest natural gas fueling station in the country and served as a model for the rest of the country. Gas-powered buses were being added to Cleveland’s streets year by year and air pollution was being reduced a little as each new bus joined the fleet. Worldwide, today, LNG provides a quarter of the world’s energy needs. There was a similar story of inexperience in dealing with LNG seven years before the Cleveland tragedy. Had it been better known in Cleveland, perhaps the 1944 accident might never have occurred. The 1937 accident happened at a New London, Texas, school, known as the world’s richest school because seven oil wells stood on its grounds. A gas explosion on March 18, 1937, demolished the whole building and killed 280 children, fourteen teachers, and two mothers. The tragedy was caused by the accidental ignition of large quantities of LNG that had leaked into the building. The school was set in the middle of the oil fields of eastern Texas and it shared in the wealth-producing output of these oilfields that were at their peak of production at that time. The students at the school came from the homes of workers in the oil fields, some of the students arriving daily from as far away as fifteen miles. A natural gas line in the basement was the source of heat for the school but on the day before March 18, 1937, this line sprang a leak. Natural gas was a new thing at this time and the dangers associated with its use were little known. Even as recent as 1944, it was still only partially understood. In New London, Texas, natural gas was used in the form in which it came out of the ground; that is, it was odorless. Gas leaks were, therefore, not detectable by humans. In later years, some odor was always added for safety. On Thursday afternoon, March 18, 1937, some classes had been dismissed for the day but about six hundred students remained. A group of mothers were at a meeting nearby. The gas leak that developed on the previous day was still there and natural gas had already filled every room of the school but no one was aware of this because it did not give off any detectable odor. As is now so well known, all that was needed in such a situation was a tiny spark and a huge conflagration would follow. A teacher in the manual skills section switched on a main power switch in order to start a power lathe and on contact there was a small spark. The whole building became a bomb. Walls buckled, the floor lifted and the roof broke up and then collapsed. There was no time for anyone to escape. It was all over in a very short time and the damage was evident. Everywhere around there was dense smoke and rubble. Parents rushed to the school and some tried to tear away at the mountain of debris in search of their children. Others were just paralyzed. An army of workers from the oil fields arrived and began to dig for survivors. They brought in heavy lifting equipment and moved away the larger pieces of concrete. Some bodies were so badly broken that identification was impossible. Every available building in the New London area became a temporary morgue. Some bodies had to be taken to Dallas, almost a hundred miles away. The search for bodies went on into the night of March 18. Giant floodlights were mounted for the workers. A line of helpers passed buckets from one to the other. In the middle of their night work a storm that broke over the area slowed them down but by morning the site was cleared. Eighty-five were found still alive and 294 dead. Two more died later from their injuries. A new school was built in due course and a memorial was erected nearby, a reminder of the terrible events of 1937. Investigators concluded that no one person was responsible for the tragedy. They decided it was the collective faults of individuals who were ignorant of or indifferent to the precautionary measures needed. Years after both the New London and Cleveland tragedies, another explosion from gas occurred, this time from an LPG installation in Mexico. On November 19, 1984, a store of LPG exploded, sending a cloud of gas into the air followed by a series of explosions and fires. One of the explosions was so powerful that it registered 0.5 on the Richter Scale at the seismograph station on the University of Mexico Campus. Five hundred people were killed and 7,000 injured as a result of this event. In the 1940s, the Mexican government, through its state oil company Pemex, decided to store LPG in selected centers and distribute it to consumers by truck rather than build a gas pipeline from the gas fields to specific markets. San Juan Ixhuatepec was one of these storage centers in Mexico City and from it twenty-four-gallon drums were loaded daily and trucked to the surrounding communities. It was a good arrangement from the consumers’ point of view. Gas reached most people in most places quickly and most Mexicans cook on propane stoves. The explosion early on November 19, 1984, was triggered by a gas leak in one of the storage tanks. Pressure had built up in that tank and a relief valve was forced open. Mexico City is in a warm climatic zone and temperatures can rise very high at times. To allow for the impact of temperature on the storage tanks they are designed to cope with pressures much higher than they normally encounter. A rise in internal temperature means an increase in internal pressure because some liquid gas always vaporizes under these circumstances. This can easily happen if the insulation is weak. Whether the quality of insulation was inadequate, or because of some other weakness in the storage tanks, pressure did rise high enough to force open a relief valve and allow a cloud of gas to escape. This was not a surprise to the workers. They encountered danger signals and tragedies before, all of them related to Pemex. A few months earlier eighty-nine Mexicans died and hundreds were injured in four separate accidents at Pemex installations in other parts of the country. The residents at Ixhuatepec knew about these and lived in constant fear of an explosion. Smell of leaking gas was a constant complaint but management staff took little notice of it. A worker, on the night of the accident, reported that the pilot flame at the plant had gone out, something that should never happen, and in its place was a loud hissing noise. Several other workers noted that a strong smell of gas had been detected over the whole area on the previous night. Evidently a substantial amount of gas had escaped and a spark from somewhere set off the first explosion. A series of fires followed; then a much more powerful explosion as two very large cylinders were heated by the fires and blew up. More explosions and fires followed as other tanks were caught in the conflagration. Fireballs erupted all around the plant whenever another cylinder or pipe blew up. Masses of fragments of metal rained down. One six-foot section of piping was flung two miles away. Another section landed on a house half a mile from the plant, killing twenty-one people. In one nearby area two hundred houses were totally demolished by a fireball. Most of the occupants died in their sleep. For several hours there was no organized evacuation. People just fled to the hills to get away from the fires. Some badly hurt people were left to die on the street. Nine months after the explosion and all that followed, there was still no report from Pemex on the tragedy. The Netherlands Organization for Applied Scientific Research which tracks accidents of this kind from all over the world did report however in a detailed analysis of the event. The claim from Pemex that the disaster started at a neighboring plant was rejected. The Netherlands confirmed that a leak from a pipe in the installation at Ixhuatepec was the cause. The term used for the type of explosion that occurred is BLEVE, meaning boiling liquid expanding vapor explosion. Four of the explosions were big enough to be recorded on the local university’s seismograph as the equivalent of a 0.5 on the Richter Scale. The true count of dead will never be known. The official figure stands at five hundred but some were sure that the number was higher. Almost no attempts were made to identify those who were killed. A day after the tragedy, coffins containing the remains of the first three hundred victims were placed in two huge holes, each five hundred feet wide, in the hillside of a cemetery close to Ixhuatepec. Investigators from Holland who had been brought in to assess all aspects of the accident confirmed that only 25 of the three hundred had been identified before burial. For most of them, therefore, their families have no official record of their deaths. About 150,000 people had lived close to the plant, against all the rules governing industrial safety. In a large LPG plant like this one at San Juan Ixhuatepec there should have been no homes near the plant. However, in Mexico, land costs within the city are prohibitive for those who work for Pemex. They take the risk of living next door to the huge LPG cylinders and company officials do not interfere. They were the ones who were killed or injured. Even in the aftermath of this terrible tragedy, when what remained of the neighboring homes had been cleared away, new homes began to appear where they had previously been illegally located.